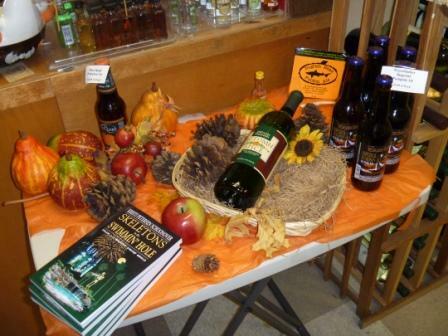 The display Brookfield Country Wine & Spirits Owner Louis put together! When Skeletons first came out, I wanted to look at some creative places at which to sell it—I didn’t want to go just the bookstore route. My neighborhood wine shoppe, Brookfield Country Wine & Spirits, seemed like a good place to try it out. Owner Louis Venezia did a terrific display with Halloween-themed products, and I’m happy to report that they’ve sold more copies than I would’ve expected…every time I stop in there, they need more books! Indeed…Spirits and Skeletons make a great fit! AND they will ship! Seriously, they had some A.W.E.S.O.M.E. scotches in their but I didn’t have the room to take them home with me! But he gave me his card and said they’d ship. YAYAYAY! Great store, for real. I’m a wine snob and not afraid to say it, and this guy knows his wine. :o) I know that he provided many ‘fruitful’ evenings full of libations! LOUIS IS THE GOD OF GOOD ALCOHOL!